Grace Under Pressure is the tenth studio album by Canadian rock band Rush, released in April 1984 on Anthem Records. After touring for the band's previous album, Signals (1982), had come to an end in mid-1983, Rush started work on a follow-up in August. The band had decided to not work with its longtime producer Terry Brown, who had worked with Rush since 1975. The new material continued the group's change in direction towards a keyboard-oriented sound as per the previous two albums. After some difficulty in finding a suitable a producer who could commit, the album was recorded with Peter Henderson. Grace Under Pressure reached number 4 in Canada, number 5 in the UK, and number 10 on the Billboard 200 where it reached platinum for selling one million copies. In July 1983, Rush ended its 1982–1983 tour of North America and the UK in support of its previous album, Signals (1982). The group reconvened in mid-August to write and rehearse new material for a follow-up in a lodge in Horseshoe Valley in Barrie, Ontario. The sessions were productive, partly due to the set amount of time they gave themselves to work in and that studio time had already been booked. The band adopted its usual working method of Geddy Lee and Alex Lifeson working on music while Neil Peart worked on lyrics. News stories from the Toronto-based newspaper The Globe and Mail inspired some of the lyrics on the album, particularly "Distant Early Warning," "Red Lenses" and "Between the Wheels." Peart wrote that they came up with "Between the Wheels" on the first night and, after a few days, "Kid Gloves" and "Afterimage." In three weeks, the group had assembled a demo tape of the aforementioned tracks along with "Red Sector A" and "The Body Electric." Development then paused in September 1983 while Rush performed five nights at Radio City Music Hall in New York City, after which the band resumed album rehearsals. 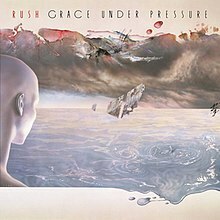 Grace Under Pressure is the first Rush album that was not produced by Terry Brown since its 1974 debut effort. At the beginning of the Signals tour in April 1982, Rush met with Brown in Miami to inform him that the band had decided to work with a different producer. The group wished to explore different approaches and techniques that someone else might offer which in turn would develop their sound, but stressed that the change did not suggest any dissatisfaction in Brown's production. Peart recalled that the split was tough for both parties considering the length of time they had worked together, but that they split on good terms. Brown receives a tribute in the liner notes of Grace Under Pressure in French which translates to "And always our good old friend." The search for a new producer began during Rush's 1983 European tour, where the band met various individuals during their visit to the UK. They met Steve Lillywhite, who initially agreed to the project, but he backed out two weeks before the band was to start rehearsing, as he had decided to work with Simple Minds instead. They had Yes bassist Chris Squire and singer and producer Trevor Horn, who once sang in Yes, to attend their concert at Wembley Arena with the prospect of choosing one of them to produce. Eventually, the group started pre-production alone, which Peart thought increased the band's desire to succeed: "This really drew us together and gave us a strong resolve and a mutual determination to make a really great record." Rush then met with another English producer during rehearsals who showed promise, but various problems that hindered his availability could not be solved in time. This was followed by the arrival of Englishman Peter Henderson, who the band liked and agreed to produce and engineer, but his occasional indecisiveness left the band to handle the majority of the creative decisions themselves. Despite this, Rush and Henderson are credited as co-producers in the liner notes. After a collection of demos had been worked out, the group entered Le Studio in Morin-Heights, Quebec to record, from November 1983 to March 1984, the longest period Rush had taken to record an album up to this point. The band spent up to 14 hours per day in the studio. In a 1984 interview, Lifeson picked Grace Under Pressure as the "most satisfying of all our records." A music video produced for "The Enemy Within" would be the first played by the Canadian music television channel MuchMusic, which launched in August 1984. Musically, the album marks yet another development in Rush's sound; while continuing to make extensive use of synthesizers as on Signals, the band also experimented by incorporating elements of ska and reggae into some of the songs. The guitars played a larger role than on Signals, with Lifeson stating that "I think the guitar on Signals took a bit of a back seat. The keyboards were really upfront ... though in a sense that's what we were trying to achieve, we wanted to go for a different perspective on the whole sound. But, possibly, we lost direction at times on Signals." Lifeson pointed out that there is no acoustic guitar on Grace Under Pressure and the lack of ballad type songs. "The Body Electric" features a guitar solo with an added harmonizing effect with delay which Lifeson described as "pretty bizarre." "Afterimage" was written about Robbie Whelan, a tape operator at Le Studio who was killed in a car accident a year prior to the album's release. The cover was designed and painted by Hugh Syme, who had designed album covers for Rush since 1975. The back cover features a band portrait by Armenian-Canadian photographer Yousuf Karsh. The group had decided to employ Karsh when they discussed ideas for the album's sleeve during rehearsals in Horseshoe Valley. Lifeson suggested to Peart a black-and-white band photograph, as the band had not done something like that on previous albums. Lee was enthusiastic towards the idea and suggested to use Karsh. Lifeson spoke of the end result: "It's definitely not a rock 'n' roll picture, but it's a very true, realistic picture of the three of us." The original vinyl pressing also featured a photo depicting an egg being held in a C-clamp. Grace Under Pressure was released in April 1984. It reached No. 4 in Canada, No. 5 in the UK, and No. 10 on the Billboard 200 where it reached platinum for selling one million copies. Rush filmed promotional videos for "Distant Early Warning," "Afterimage," "The Body Electric" and "The Enemy Within." 2015 Mercury CD, LP Digitally remastered, 200 g audiophile vinyl. Also available in 24-bit/96 kHz and 24-bit/192 kHz digital formats. All lyrics written by Neil Peart; all music composed by Geddy Lee and Alex Lifeson. ^ "Revisit: Rush: Grace Under Pressure". 16 February 2016. Retrieved 12 July 2016. ^ "Grace Under Pressure (1984) Stereogum". Retrieved 12 July 2016. ^ a b c d e f g Barton, Geoff (May 3–16, 1984). "The Pressure Principle". Kerrang!. No. 70. Retrieved 24 December 2018. ^ a b c d e f g h Peart, Neil (1984). "Pressure Release". ^ a b c Popoff, Martin (2004). Contents Under Pressure: 30 Years of Rush at Home and Away. ECW Press. pp. 110–111. ISBN 978-1-55022-678-2. ^ "Ask YES – Friday 5th July 2013 – Chris Squire". YesWorld. 5 July 2013. Retrieved 16 December 2018. ^ Hansen, Eric. ""Playback: The Making Of An Album – Rush 'Grace Under Pressure'" – Guitar Player, August 1984". Retrieved 12 July 2016. ^ a b MacNaughtan, Andrew (June 1984). "Alex Lifeson". Free Music. Retrieved 24 December 2018. ^ Swenson, John (May 1984). "The Saga Continues: Alex Lifeson and Geddy Lee divulge some of their trade secrets". Retrieved 24 December 2018. ^ Prato, Greg. "Grace Under Pressure – Rush". Allmusic. Rovi Corporation. Retrieved 2012-03-11. ^ Loder, Kurt (21 June 1984). "Grace Under Pressure". Rolling Stone. Retrieved 2012-03-11. ^ Clouse, Matthew. "Rush: Grace Under Pressure Album Review". theodysseyonline.com. Retrieved 9 January 2019. ^ Thelen, Christopher (2019). "The Daily Vault Music Reviews : Grace Under Pressure". dailyvault.com. Retrieved 16 February 2019. ^ "12 MONTHS OF RUSH: 14 ALBUMS FROM MERCURY ERA FOR RELEASE IN 2015". Rush.com. Retrieved 10 July 2015. ^ "Andy VanDette On Remastering 15 Rush Albums – The Masterdisk Record". Archived from the original on 23 August 2014. Retrieved 12 July 2016. ^ "Grace Under Pressure Billboard Albums". Allmusic. Rovi Corporation. Retrieved 2012-03-11. ^ "Top Albums/CDs – Volume 40, No. 10, May 12, 1984". Library and Archives Canada. Retrieved 2012-03-11. ^ "Grace Under Pressure Chart Stats". Chart Stats.com. Retrieved 2012-03-11. ^ "Rush – Grace Under Pressure (Album)". Swedishcharts.com. Media Control Charts. Retrieved 2012-03-11. ^ "Rush – Grace Under Pressure (Album)". Gfk Dutch Charts (in Dutch). Media Control Charts. Retrieved 2012-03-11. ^ "Album – Rush, Grace Under Pressure". Charts.de (in German). Media Control Charts. Retrieved 2012-03-11. ^ "The Body Electric Chart Stats". Chart Stats.com. Retrieved 2012-03-11. ^ "RIAA Database Search for Grace Under Pressure". Recording Industry Association of America. Retrieved 2012-03-11. ^ "Gold Platinum Database – Title: Grace Under Pressure". Music Canada. Archived from the original on 2012-09-07. Retrieved 2012-03-11. ^ "BPI Certified Award Search for Rush". British Phonographic Industry. Archived from the original on 2011-07-04. Retrieved 2012-03-11.